This site is devoted primarily to the history and technology of the range of 35mm rangefinder cameras produced by what became the Canon Camera Company. It covers the beginning from its development of the "Hansa Canon" (or "Canon Hansa") in 1935 until the end of production of the Canon 7s rangefinder in 1968. These 35mm film cameras featured lenses mounted in a Leica thread mount design, called the M39 (or in near equivalents in the first years of Canon production). Described here also is the wide range of interchangeable lenses and accessories Canon later developed for their cameras. In addition to the distinguished series of Canon Rangefinder Cameras, this site also has pages describing the Minolta Rangefinder Cameras which featured M39 interchangeable lenses. And a third section is devoted to certain other M39 interchangeable rangefinder cameras of interest to the author. I just disassembled the camera without any specific plan, but simply to take a look at each part. I found there were no special items like diamonds inside the camera. The parts were made from brass, aluminum, iron and rubber. I was surprised that when these inexpensive materials were put together into a camera, it demanded an exorbitant price. This made me angry." From its earlies days, Seiki-Kōgaku Kenkyusho which was to become Canon Camera Company had a close relationship with Nippon Kōgaku, then the manufacturer of camera glass and its Nikkor lenses. 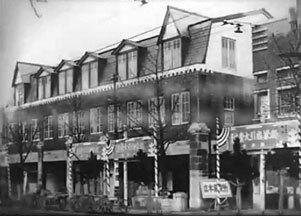 The optical company Nippon Kōgaku Kogyo - 日本光学工業株式会社 or "Japan Optical Industries Co., Ltd." had been created in 1917 23 during World War I, aided by the Imperial Japanese Navy and the Mitsubishi group. 20 Nippon Kōgaku were not yet making cameras themselves. 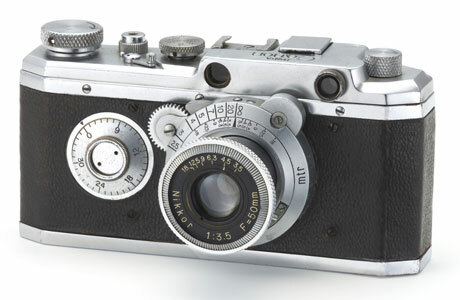 The later famous series of Nikon cameras was launched in 1948. The newly developed Seiki-Kōgaku rangefinder camera needed lenses for its 35mm format, and Nippon Kōgaku was able to fulfill that need by developing a Nikkor 5cm f3.5 lens, described below. Nippon Kōgaku provided not only the lens, but also a lens focusing mount as well as the design of the camera's rangefinder. 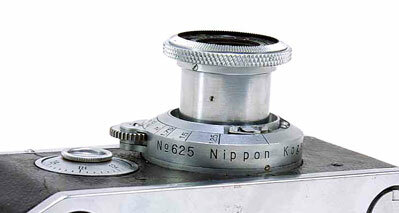 So the Hansa Canon featured Nippon Kōgaku's new Nikkor 5cm f3.5 lens, bayonet-mounted into a Nikkor focusing mount. 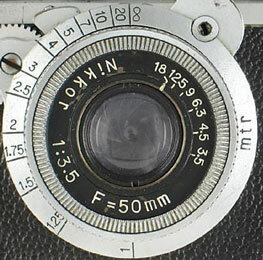 Nippon Kōgaku Kogyo provided the Nikkor 5cm f3.5 lenses in metal tubes to which Seiki-Kōgaku added a lens mounting flange for insertion into the Nikkor focusing mount. 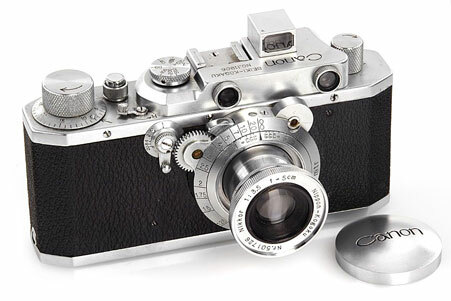 The focusing mount design avoided the Leica focusing patent which had been issued in Japan 1. Under this patent, each Leica lens was mounted with its own helicoid focusing mount, which the photographer turned to focus the lens. The lens assembly then screwed directly into the Leica camera body. The Nikkor focusing mount avoided the Leica patent because focusing was done by the mount rather than by the lens itself. 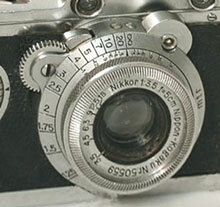 Each of the Nikkor focusing mounts had its own serial number on its outer bottom. These early Nikkor lenses had f-stops selected on the front of the lens. Initially, the marked f-stop progression was the earlier series then in use: f3.5, f4.5, f6.3, f9, f12.5, f18. The Nikkor lenses came first with black faces and beginning in 1937 with white faces. 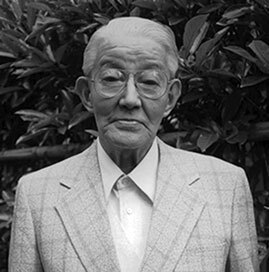 Seiki-Kōgaku did not yet have camera sales ability. However, they had a contract with Omiya Shashin Yohin Co., Ltd. (Omiya camera and accessory shop) (大宮フォトサプライ). The owner of Omiya, Hikotara Noro had been one of those instrumental in changing the camera name from "Kwanon" to "Canon". Omiya Shashin Yohin Co., Ltd. used the marketing name "Hansa", and their Hansa trade name was engraved on the top of the camera. 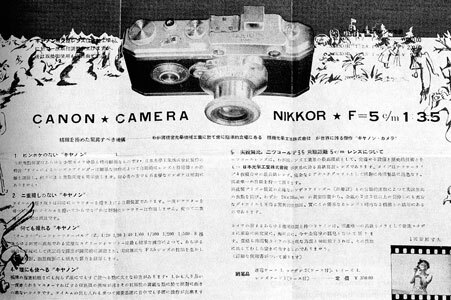 a 1935 advertisement featuring "Canon Camera" and "Nikkor f 5cm 1:3.5"
As well as selling via Omiya, Seiki-Kōgaku also sold some of these Canons, without the Hansa logo, directly to photographers. 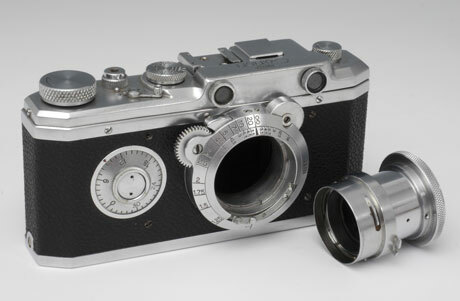 Other pages of this canonrangefinder.org website give descriptions of all the later Canon rangefinder cameras, including the Canon S of late 1938. The canonrangefinder.org site then describes all models of Canon rangefinder cameras commercialized until the end of 1968. The distinguished Canon lens line 1946-1975 is also described in separate pages (links are shown below). Finally in this site, there are pages describing the range of Minolta M39 mount rangefinder cameras 1947 to 1959. These were produced by Chiyoda Kōgaku Seiko K.K. (千代田光学精工㈱) of Osaka, Japan. It produced a series of 8 models of interchangeable lens rangefinder cameras. Also, over time, pages on other M39 mount interchangeable lens rangefinder cameras of interest to the author will be added. You can click on the links in the table below to consult these pages of the canonrangfinder.org site. Any additions or corrections to these pages would be welcome simply by contacting this site as shown at the foot of this page . 1 Dechert, Peter. Canon Rangefinder Cameras 1933-1968. Hove Collectors Books. West Sussex, United Kingdom. 1985. ISBN 0-906447-30-5. Peter Dechert's book is the most important expert source of information regarding Canon Rangefinder Cameras. 2 Kitchingman, Peter. Canon M39 Rangefinder Lenses 1939-1971. A Collector's Guide. Published by Peter Kitchingman. Perth, Australia. 2008. ISBN 978-0-646-48144-9. Peter Kitchingman's book is the definitive study of the more than three decades of M39 format camera lenses developed for Canon Rangefinder Cameras. 3 Nostalgic Canon Camera Book. 懐かしいキヤノン EI Publishing Co. Ltd. Tokyo, Japan. June 2003. 4 "Canon Camera Museum" history website. https://global.canon/en/c-museum/history/ published by Canon, Inc. accessed in 2019. Hans P. Rajner's book is an excellently detailed and carefully researched study of camera from around the world which used the Leica M39 lens mount and the same lens to film plane distance. 7 Dechert, Peter. Canon Single Lens Reflex Cameras 1959-1991. Historical Camera Publications. Yakima, Washington. 1992. ISBN 1-879561-04-2. 10 website http://www.nicovandijk.net/rflensmatrix.htm consulted 2019. 12 website www.canonrangefinder.servehttp.com consulted 2008. 14 website http://www.collection-appareils.fr/objectifs/ consulted 2019. 15 Small, Marc James. Non-Leitz Leica Thread-Mount Lenses. Wittig Books. Hückelhoven, Germany. 1997. ISBN 3-930359-47-2. 16 the Nikon Corporation website: https://imaging.nikon.com/history/ consulted 2019. 19 Katz, Jerome. The Kardon camera story: a dedication to Peter Kardon, great American patriot & pioneer. SJF Enterprises. New York, New York. 1977. 20 Baird, John. The Japaneese Camera. The History of the Japanese Camera Monograph Collection. Historical Camera Publications. Yakima, Washington. 1990. ISBN 1-879561-02-6. 22 Alexander, Jeffrey Scott. Nikon and the sponsorship of Japan's optical industry by the Imperial Japanese Navy 1923-1945. MA Thesis. University of British Columbia. 2001. 23 Alexander, Jeffrey Scott. Nikon and the sponsorship of Japan's optical industry by the Imperial Japanese Navy 1923-1945. PhD Thesis. University of British Columbia. 2010.